Valentine’s Day is coming up, which leads to a question: How to keep the romance of Valentine’s Day all year long? 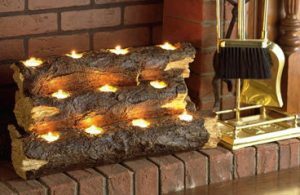 You can start by creating a more romantic atmosphere in your home. Whether you’re married, living together or single, life becomes more enjoyable when you add a dash of romance. Everyday routines become much more sensual. Things as simple as having a glass of wine or unwinding after a day of work can become intriguing, passionate or downright hot. Start with the lights. Dimmers let you create the atmosphere you feel most comfortable in. Lamps can be eclectic with international mystique, and you can choose the color of the shade and how strong of a bulb you want. Fire and candles provide the softest and most flattering light. The Flickering Ember Tealight Log is perfect for beside the love seat. The Intrigue Wall Mount Sconce brings sophisticated sensuality to the bedroom or bath. You can click through to find out more about these two accessories below. Now how about a bottle of wine? 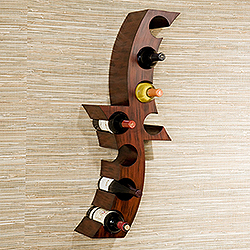 This wall-mounted wine rack has an alluring, abstract style. Its Asian hardwood construction brings both natural warmth and organic beauty. It’s a piece that fits well with almost any style of décor. Little touches like these can add up and bring a lot of romance into your life. They make it just a little bit easier for you to relax and enjoy spending time with someone special. And yes, you deserve it!